We were brought on to the project by SixSides and Back to work on the interactive installation at the Rock City Experience Center in Namsos, Norway. The center is designed to tell the story of Norwegian rock music known as trønderrock. Visitors can write and mix songs, play in a Guitar Hero-type band, design their own CD-covers and much more. 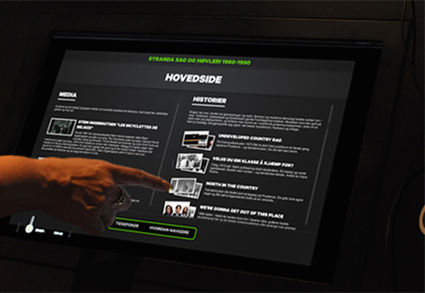 We were responsible for developing an interactive desktop app that presents the history of Norwegian rock music via multimedia on interconnected touch-screen displays.